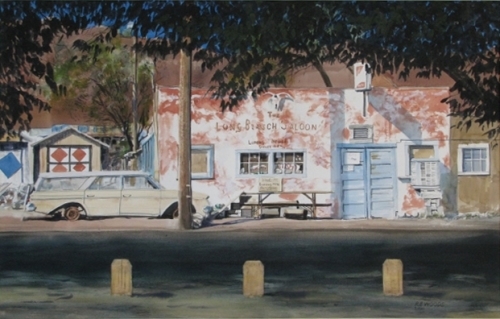 The Long Branch Saloon, Luning, Nev. The Long Branch Saloon in Luning, Nevada is one of those leftover relics of days gone by, passing into history. What I liked was the little personal touches here and there, and connections with my own life, like the Rambler station wagon down on its rims, but very similar to one I rode in when it was new. Watercolor, September, 2012.